NEW: This method is now part of the Content Aware Fill feature in Adobe Photoshop CS5. A journal preprint from TPAMI March 2007, can be found here (pdf, 30MB). A shorter version from CVPR 2004 is here (pdf, 3.5MB). Sophisticated video removal (of undesired static or dynamic objects) by completing the appropriate static or dynamic background information. 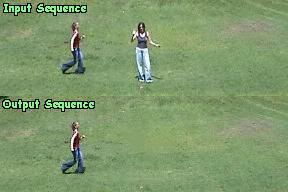 Synthesis of new video frames to add a visual story, modify it, or generate a new one. Some examples of these are shown in the paper. An implementation inspired by this work for filling images is available here. Note: these are new results -- improved since the video demo in CVPR'2004. See details in the journal version. Added raw uncompressed data for some of the following examples. These videos can be used in publications provided the above paper is cited. Raw data may be found here (zip, 9MB). Raw data may be found here (zip, 5MB). Raw data may be found here (zip, 32MB). 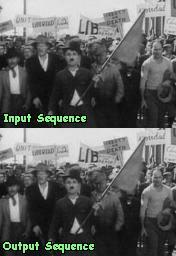 Retouching of old Chaplin movie with simulated large "coffee stain"
Full field-of-view of stabilized video.